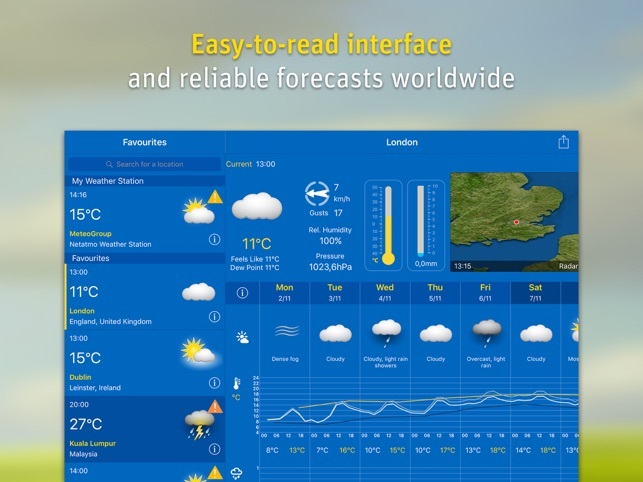 WeatherPro for iPad has been created by MeteoGroup, Europe’s leading private weather company. 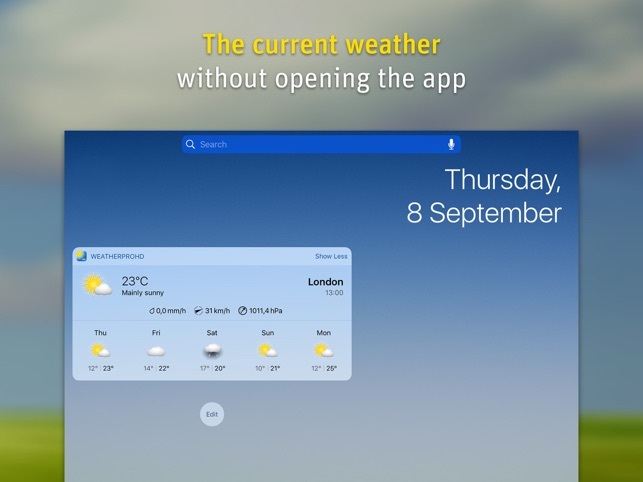 This reliable weather app offers unrivalled, high-quality, detailed information, clearly visualised in an easy-to-read interface. 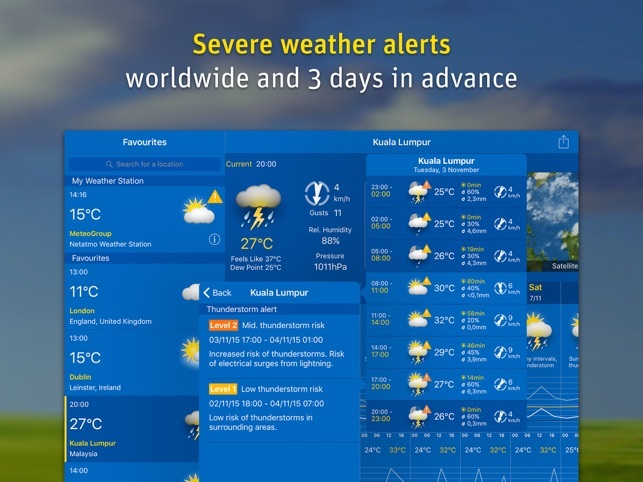 These features are all brought to you by passionate weather professionals– hence the name WeatherPro! 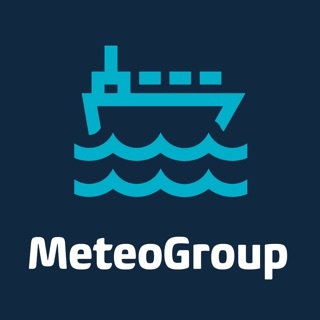 One subscription covers Premium services on all weather apps by MeteoGroup: WeatherPro, MeteoEarth, AlertsPro and RainToday. The live webcam images from webcams.travel are now also available for the iPad and can be accessed via the new webcam icon on the top toolbar. I use the premium version. 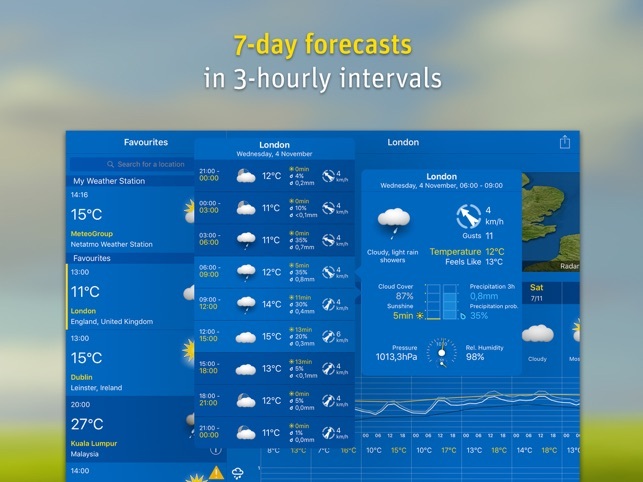 It is a quality product with generally accurate forecasts, certainly as accurate as the Met office. It does require a fast broadband connection, it can seem a bit blocky when I am away from my home Superfast 35 Mb/s download. Overall I am a happy customer. One year on and I'm still a happy customer. I also use the smartphone version on the road, which has the same capability, but less detail due to the smaller screen size. 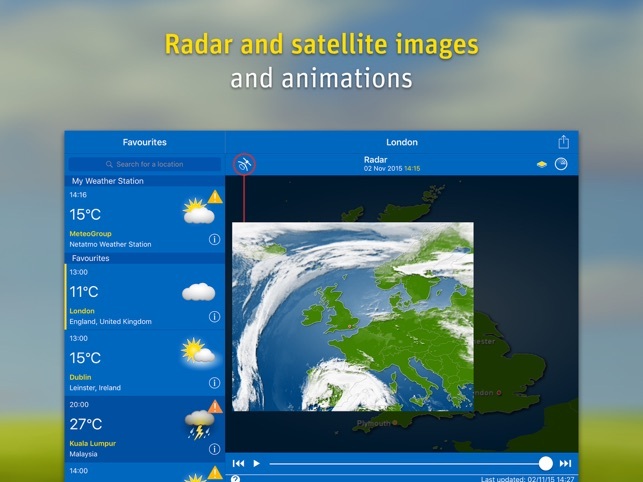 MeteoEarth I also find useful, particularly the animated graphics which display expected wind speeds and rainfall rates. A great app which I've been using for years. As a glider pilot I tend to keep a close eye on the weather and use a number of forecasting tools and this is one of the best. I especially like the radar and this is the most used function. Like some others I prefer the phone version as its so much easier to scroll through the hourly data. I upgrade to the premium as I find the the precipitation type radar and 14 day forecast useful. Not as keen on the satellite feature so tend to use Sat24 for cloud cover. This year I paid my update prescription via my iPhone, but unlike previous years, it didn’t update the the iPad subscription, so thinking it would do the usual, when I sanctioned, the payment - say ‘you have already paid this subscription’ and updated without further cost - it’s gone and charged me AGAIN. Needless to say - I’m not too happy about this (in fact I’m mad as hell)! I wonder if I’d have updated the subs on the iPad first, it would have still double charged me when I attempted to update the phone? I suppose I must say that I’ve no problem using the app and it’s accuracy, it’s just the fact I’ve been charged twice! Something else I’ve noticed - 3 months £1.99; 1 year £8.99 ????? ?